Vanilla white chocolate chip cupcakes topped with a creamy swirl of Biscoff buttercream frosting! If you’re wondering what cookie butter is exactly, then if you ask me I will tell you it is one of the most heavenly foods out there! The spread is made of ground Speculoos biscuits and just like Nutella I could it by the spoonful jar. Speculoos (or speculaas) is a traditional Dutch spiced biscuit very popular here in Europe. They’re crunchy in texture and have a gorgeous warming flavour from spices such as cinnamon, nutmeg, ginger, cloves and cardamom. Once the cupcakes are fully baked and have had a chance to cool, I made my frosting. You may be tempted to devour the frosting straight from the bowl. To make it, simply cream the butter until pale, then add the icing sugar along with the vanilla extract and beat for about 5 minutes until the frosting is light and fluffy. Then all that is left to do is add the Biscoff cookie spread and mix. Make sure you adjust the consistency with a splash of cream or milk as this will make it easier to pipe onto the cupcakes. Swirl each cupcake with the frosting and then decorate with a sprinkle of Speculoos biscuit crumbs, white chocolate chips and half a Speculoos biscuit. These were really easy to make and will certainly impress all your family and friends. 1. Preheat your oven to 180C / 350F / Gas Mark 4. Line a cupcake tin with 12 cupcake paper liners and set aside. 2. To make the cupcakes: Cream the butter, sugar and vanilla together until light in colour and very fluffy. Add eggs one by one and mix to combine. Toss the white chocolate chips with about a tablespoon of the weighed out flour, then add to the bowl along with the remaining flour and the milk and mix until just combined and no lumps of flour remain. 3. Evenly distribute the cupcake batter between the cupcake liners. Bake in the preheated oven for 15-20 minutes or until a cake tester comes out completely clean of any uncooked batter. Leave to cool in the tin for 5 minutes, then when cool enough to touch remove from the tin and transport to a wire rack to finish cooling completely. 4. To make the buttercream: Cream the butter until really pale in colour. Add the sifted icing sugar and the vanilla extract and mix together until the butter and sugar has combined. Continue to beat until fluffy and very creamy in colour and texture. Once the buttercream is fluffy add the cookie butter spread, and mix until combined. If the mixture if too stiff loosen with the cream or milk until you reach the desired piping consistency. 5. To decorate: Fit a large disposable piping bag with your favourite nozzle – I love the large star tip for cupcakes. Fill the piping bag with the frosting. Pipe even swirls on the top of each cupcake, or use a small cake palette knife and spread the frosting onto each cupcake. Finish by decorating with biscoff crumbs and biscuit halves, and or white chocolate chips. Note: I recommend topping the cupcakes with the biscuit half just before serving, otherwise it loses its crunchiness. Baking time will depend on your oven. This recipe recommends 15-20 minutes, but different ovens may cause the baking time to differ slightly. For the frosting I like to add a few tablespoons of double (heavy) cream. The cream makes the frosting lighter and it will have a creamier texture. If preferred you can substitute with milk but please note that frosting will not have such a creamy texture. I also reduced the sugar in the frosting so it wasn’t too sweet. But you can adjust the frosting to your own taste. The frosted cupcakes will keep in an airtight container for up to 3 days. Cupcakes never last that long in our house! These look incredibly scrumptious, Jess! I’m also obsessed with Biscoff. I may or may not have eaten it out the jar 😉 Pinned! Thanks Marsha! They were really delicious – just wish I’d made more now! 😀 Thanks so much for the pin too! Speculoos biscuits are the best! When I went to the Netherlands a few years ago, they were selling Speculoos Latte´s at Starbucks. I was hooked immediately! These cupcakes are so pretty!! Thanks Johlene! Speculoos are super yummy! Love the sound the the Speculoos latte, that must have tasted incredible! Glad you like the cupcakes. Wow these cupcakes sound amazing, Jess! I’m practically addicted to cookie butter, so I know I would love these. What a creative idea! Thanks so much, Gayle! Cookie butter is super addictive! So happy you like the cupcakes – they’re definitely great for cookie butter lovers! Yes, chocolate is ALWAYS the answer! Love these cupcakes ! I need to get my hands on Biscoff ASAP! It sounds so decadent! Thanks Samina! Chocolate always makes any bake even better, right?! 😉 You have to try Biscoff, it’s SO good! Yes!! I love Biscoff cookies, and therefore I’m fairly certain I will love these cupcakes. They look awesome, Jess!! Thanks David! 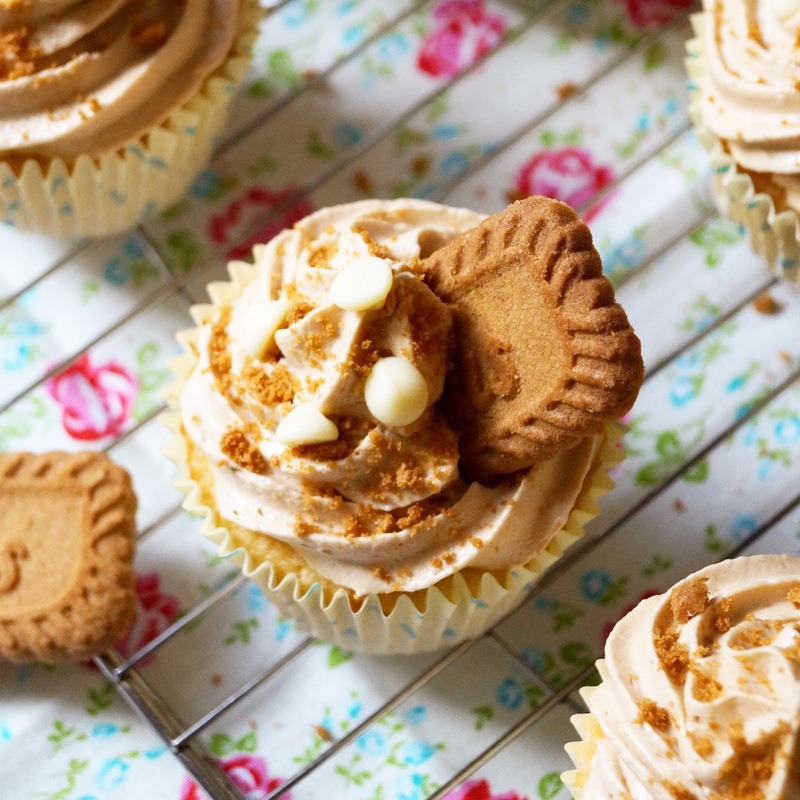 If you like Biscoff, then you will definitely love these cupcakes! Those cupcakes look delicious – what a great idea! Absolutely love Speculoos, can’t wait to try this out someday! I want all the Biscoff spread. All. Of. It. Your cupcakes look epic, and I’m ready to eat your entire batch!! Self rising flour substitute is plain flour + 2tsp of what? Hi Hala! Sorry it was typo, forgot to add to add that to the post. It’s + 2 tsp baking powder. Oh my goodness – these look delicious – I could eat one right now … and it’s early in the morning lol! Isn’t cookie butter just the best? I can get into trouble with a jar of that. These cupcakes look so good. And you’re right, they would really impress anyone you served them to. Thanks Amanda! Cookie butter is my favourite, I’m addicted to it! 😉 Thank you for the lovely words – I’m pleased you like them! These are the answer to questions I didn’t even know I had, needs I didn’t even know weren’t being met. Beautiful. These are gorgeous Jess! I love the sound of these cupcakes! The decoration is stunning too – love the way you topped them with cookies and white chocolate. Delicious! I love biscoff so much! These cupcakes look incredible!!! Jess, these look gorgeous! I love the flavors you’ve described here. Just lovely! I love cookie butter with white chocolate — it’s such a delicious combination! These cupcakes look amazing, Jessica! This sounds like such a yummy cupcake! Love how you decorated them! What beautiful cupcakes! They look delicious too! These cupcakes look amazing, Jess! Love the biscoff in here! So fun and delicious! These look incredibly delish, Jess. Addition of biscoff sounds fun and so delicious! And that That cookie butter frosting is ah-mazing. What I love most about your recipes is the combination of flavors. It seems like nothing can go wrong with that! 🙂 Next time I’ll add white chocolate chips to my cupcake batter, too! What cute little cupcakes! I always go with chocolate cupcakes when I have a cupcake craving, but you have made me think that I need to try something else. Thanks Dannii! Love chocolate cupcakes, but these ones were fantastic! I have no idea why but I’ve always called these cookies Lotus cookies instead of biscoff! I love these cookies to bits and incorporating them into cupcakes look so amazing and delicious! These cupcakes are adorable!!! I LOVE Biscoff cookie biscuits! Jess your cupcakes are just gorgeous. so pretty and perfect treat for a gathering I will be hosting at the end of the week. Sharing! These look amazing! Love biscoff! Gorgeous pictures as always! Wowza! These cupcakes are TOTALLY speaking my language!! I’m allergic to cocoa, so white chocolate is my heaven on earth splurge! I am just dying over these, girlfriend! Vanilla and white chocolate chip cupcakes, on their own, sound amazing! But that Biscoff Buttercream Frosting on top?! YES YES YES YESSSSSS! Pinned! Cheers! Thanks so much, Cheyanne! Your comments always make my day! 😉 I’m so pleased you like the cupcakes – white chocolate goes so well with Biscoff! Thanks for pinning! These cupcakes have captured my heart and my stomach. I could eat biscoff by the jarfull. What a gorgeous cupcakes! I can imagine eat one of these with a nice cup of tea! What a great idea for fall! Yessss! I have an undying love for Biscoff!! These cupcakes are so beautiful! Love that you used a white chocolate chip vanilla cupcake and all of those gorgeous cookie crumbs on top! Yum!! Thanks so much, Michelle! Biscoff is the best thing ever, right?! 😉 The white chocolate chip cupcake worked really well with the spiced cookie butter frosting! These cupcakes are adorable!! I think I have been missing out on speculoos cookie butter spread. It sounds amazing! Thanks so much, Thao! You have to try the cookie butter spread! It is SO addictive! These look incredible! Absolutely gorgeous. These are beautiful. I do believe cookie butter anything is to be consumed by the cook and not shared. Maybe I’m the only one who feels this way. You can probably just hand me a bowl of that cookie butter frosting and I’ll be content for the rest of my days. AMAZING. What beautiful cupcakes! That cookie dough frosting sounds amazing! Thanks Christin! The frosting was delicious! Wow Jess, these cupcakes are beautiful! I can’t believe I’ve never had cookie butter before- now I definitely need to try it! My goodness!! These cupcakes 🙂 It only made sense to follow that cookie butter frosting with the appropriate cupcakes!! I so need to get me som Biscoff spread. These cupcakes look heavenly, my tummy is grumbling! Fantastic combination of flavours. Sammie. What a brilliant way to make use of Biscoff spread! Maybe making these will make me stop eating it straight from the jar haha!! Hi – sorry about that! It was a typo, I forgot to add that step to the recipe! Apologies but thanks so much for letting me know. 🙂 I’ve just updated now, the white chocolate chips are tossed in a little bit of the flour and then folded into the cupcake batter. Hope you enjoy the cupcakes!